Trade shows like EICMA are places where many manufacturers dabble in areas outside their primary expertise in order to gauge the marketplace for new ideas. Since 2010 especially, a cadre of electric two-wheel concepts have come our way. Everyone from Smart, to MINI and now Piaggio have brought us electric scooters or bicycles of one sort or another. This latest effort from Vespa’s parent company is simply dubbed the E-Bike Piaggio. The E-Bike Piaggio checks all the electric vehicle concept boxes. Smartphone integration? Check. Color scheme from an Olympic ski jump team? Check. Exotic materials? Check. Yet there are some real specs to consider as well. The E-Bike Piaggio is powered by not just your feet, but also by an in-house developed 250W-350W electric motor. Powering that motor is a removable and portable 400Wh battery. Piaggio are saying this gives the E-Bike a range of 35-70 miles depending on terrain, rider weight, and how much you pedal along. There’s no word yet on whether or not Piaggio will bring the E-Bike to market, but folks on the ground at EICMA report that the level of finish on the E-Bike makes it look like a pre-production model. We’ll see if Piaggio actually delivers on the concept. We never did see that Smart electric scooter, even though they’ve threatened to produce it twice now. I wonder if they’ll build me one without pedals. 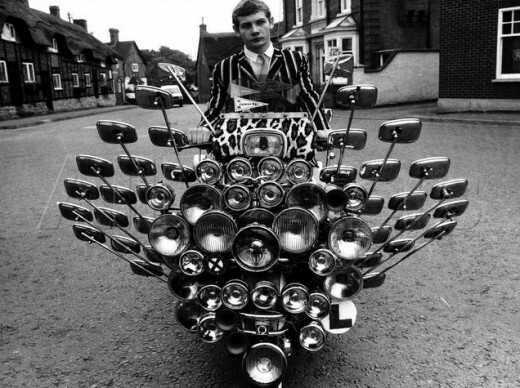 I’ve never heard a great explanation as to why the Mods of the ’60s covered their scooters in lights and mirrors. Yet they’re so essential to the style that it’s easy to just take them as a given.